In the French kitchen garden or potager, gardeners have intermingled vegetables, fruits, flowers, and herbs since medieval times. For the French, the potager has always been the country counterpart of the grand chateaux parterres. Potagers are more popular than ever in France; a government survey taken in 1994 revealed that 23 percent of the fruit and vegetables consumed by the French are home-grown. In France today, potager design is typically informal, or romantic. Often called the jardin de curé, or country curate's garden, this intimate and sensual style is comparable to that of the English cottage garden, except that it is centered on vegetables rather than flowers. Its inspiration is a complicity with nature rather than a desire to impose order, and this fashion has been fed by the growing influence of organic gardening in France over the last twenty years. Organic kitchen gardeners are great promoters of biodiversity, and many heirloom vegetable varieties have been saved by their efforts. They also create gardens where local fauna, including birds, insects, and even reptiles feel at home. Their gardens are often called "natural" because of their informal exuberance and spontaneity. The danger is that, as in Emerson's bean patch, respect for all comers means the weeds will eventually smother the vegetables! Each gardener must find his or her own balance with the rest of nature. Here are some suggestions that will help you create a kitchen garden in the French potager style outside your own back door. Consider how the site chosen fits into the surrounding landscape. Think about the effects of wind and hours of sunshine, but also consider the overall setting: Will it be a harmonious part of a larger picture, or completely set off by hedges or walls? Vantage point is an important design consideration, so think about where you will see the garden from most often. Next, consider the overall design. This will depend primarily on how you plan to cultivate the gardenby hand or by machine (and what kind of machine), which will determine not only the garden's shape but also how wide the paths need to be. Any pattern is possiblespiral, checkerboard, wagon wheel, cubist. As the season progresses and plants grow, the outlines of your beds will evolve. In the informal country style, there is rarely bare earth or much space between rows; the beds are quickly filled in with companion plants, mulch, green manures, or self-sown volunteers. A good design includes vertical accents. These can be temporary (a stand of corn, tomato towers, bean tepees, a single angelica plant), or permanent (berry bushes, a small apple cordon). Hedges and walls are also permanent, of course, and can themselves provide food or support for food-bearing plants. Potagers are essentially tapestries of myriad colors and shapes. The intermingling of herbs, flowers, and fruits with vegetables requires careful placement of perennials so that they do not interfere with the growth of seasonal crops. Small fruit trees traditionally stand at the edge of the potager, along paths and walls, with strawberries, annual herbs, or flowers planted at their feet. Aggressive herbs like mint or tansy must be contained. All the annuals mix well with vegetables, and may even serve as beneficial companion plantsfor example, planting coriander among carrots, said to deter the carrot fly. 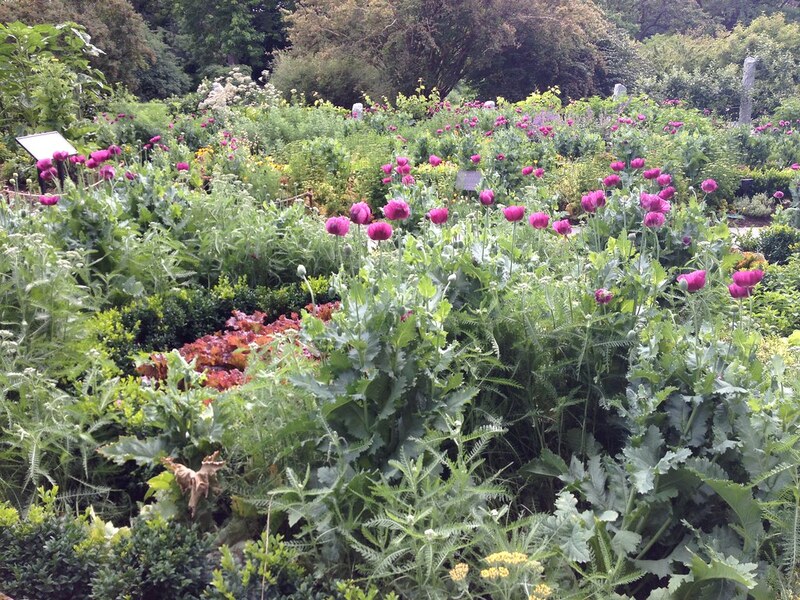 Edge plots with contrasting plants, including herbs and flowers, which will mask bare spots as the season progresses. 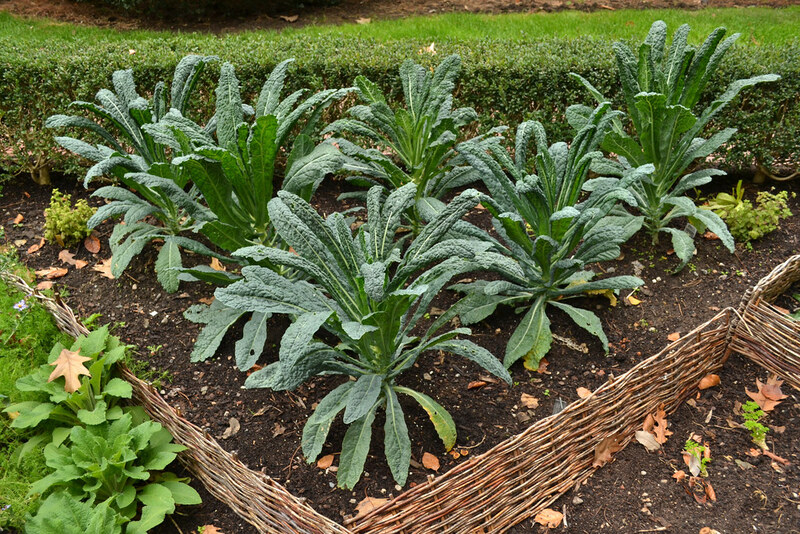 Choose varieties in keeping with the scale of the garden. Keep free-ranging perennials in bounds with buried strips of metal or plastic. After harvesting, use fast fillers such as chervil or cut-and-come-again salad greens. Many of the latter self-sow and can be moved easily to fill gaps when required. Fast-growing green manures are ideal: both mustard (Brassica) and phacelia (Phacelia tanacetifolia) are great favorites in France, both being tough as well as beautiful in flower. With a bit of effort, your potager can be as pleasing as this small Provençal plot described by novelist Henri Bosco, which "nestled under the terrace, sheltered by high, warm walls but open onto the valley full of brown and blue summits, offered to the rosebushes, the tulips, and even to the stray weeds a well of warm air which smelled all at once of fruit trees, hawthorn, and hyssop. Birds twittered among the plums...Nothing was more charming than this garden. It existed in this tiny sheltered bit of land which had trusted itself to man, under the large benevolent housejust big enough for a soul without worldly ambition, or possessing the genius of retirement." Louisa Jones is a Canadian-born writer who has lived and gardened in Provence, France, since 1975. She is the author of Gardens of Provence; Provence: A Country Almanac; Art of French Vegetable Gardening, and The World of French Vegetable Gardens. Hi Jessica! I, too, am in East Central Florida and am a huge Disney fan. You could incorporated Disney into the garden with stepping stones (great DIY for the family) and small garden statues. I’ve even seen a Mickey fountain at Lowes. Our hot summers don’t do well for most veggies to grow during July, August and September but some of the flowers are awesome. Vinca’s and lantana really love the scorching heat as do some herbs. The other 8–9 months I grow kale, chard, lettuces, onions and tomatoes. I found a wild Florida everglade cherry tomato that will grow through the summer but it needs lots of space…It’s a monster! I am trying to get affordable ideas. I don’t want to go crazy. I do know it will be stuff I know we will eat. We are just a family of three. And I definitely want to find ways to incorporate my love for Disney to make it fun for my toddler son. I also don’t know what best will work here in Central Florida. Haven’t been able to truly gauge how much sun I do get in the yard. I also want to plant flowers that will repel fleas, ticks, mosquitoes and other type of pests that will harm my garden. Open to suggestions. It’s my first time and I know I will experience lots of learning curves in the process. What an inspiring idea! We live in the Colorado prairie and I see possibilities.Thank you. What kind of fruit trees grow successfully in Provence? Do artichokes grow in Provence, as well? 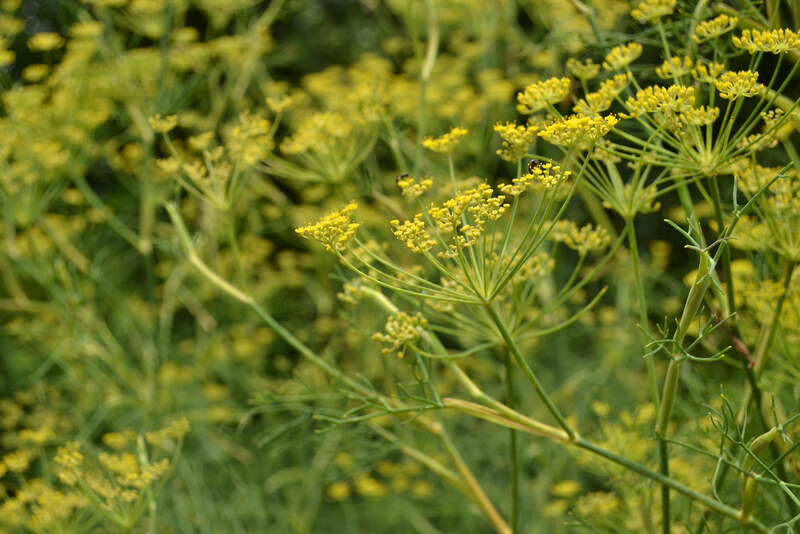 Foeniculum vulgare (fennel) in the Shakespeare Garden. Photo by Blanca Begert. BBG's Herb Garden. Photo by Caleb Leech.